Acts 20:29-30, “For I know this, that after my departing shall grievous wolves enter in among you, not sparing the flock. Dr. John MacArthur has been a longtime faithful pastor in California; however, he's not a very good Bible student. The interesting thing about MacArthur is that he often makes some brilliant theological statements, but at the same time he also has some major theological issues concerning Christ's blood, repentance and how to be saved. I like MacArthur's boldness and he does say some awesome things, which is why thousands of pastors love him dearly, but our first allegiance ought to be to God and His inspired Word. MacArthur is sincere, in my opinion, but deceived by the intelligentsia. Dr. MacArthur teaches that Jesus' blood stayed in the ground at Calvary and never made it to the mercy seat in Heaven. That alone places him in the category of being an unsaved modernist. Also, see: Dr. John MacArthur: Mainstreaming Paganism In The Church (the occult Freemasonry connection). Kindly, my opinion is that MacArthur is a spiritually dangerous man, who ought not be allowed behind any pulpit in America. My intent is not to attack Mr. MacArthur; but rather, to earnestly defend the Biblical truth that eternal life is a free gift. MacArthur says it is a gift that will cost you your life, but the Bible says it is a gift that will cost you NOTHING! It cost Jesus everything, which is why we can receive it freely. I am shocked how many naive and careless pastors welcome MacArthur, who clearly teaches the demonic doctrine of Lordship Salvation. In fact, MacArthur teaches that children are incapable of being saved. My friend, you weigh the evidence. Obey your Bible and pray for God to show you the truth. The following video is 100% conclusive proof that John MacArthur, Kirk Cameron and Ray Comfort are all false teachers. They are all so subtle, corrupting the simplicity of the Gospel of Jesus Christ, teaching a false plan of salvation of human effort plus partial faith in Christ. As I will explain to you in a moment, Jesus wasn't giving this young man a plan of salvation; but rather, He was using the law as it was intended to be used, that is, to show the young self-righteousness man that he was still an imperfect sinner, who could not merit eternal life. Romans 3:19 says God gave His law that, “every mouth may be stopped, and all the world may become guilty before God.” Repentance is a change of mind, not a change of life (reformation). We are born-again by acknowledging our guilt of sin in God's holy eyes, and having faith alone in the Gospel of the Lord Jesus Christ. The “Gospel” is the Good News that Christ died on the cross for our sins, was buried, and bodily resurrected the third day (1st Corinthians 15:1-4). 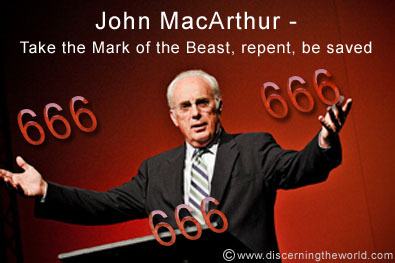 John MacArthur is a dynamic, charming and suave teacher, which has deceived millions of people to foolishly follow him. MacArthur is one of the wolves that the Bible warns us about, who teaches perverse things. The preceding video horribly perverts the meaning of two key passages of Scripture: Matthew 19:16-22 and Matthew 16:23-25. The young man didn't ask how he could get to Heaven. No, rather, he asked what THING I NEED TO DO. Jesus knew the young man's heart. The young man was self-righteousness. Jesus used the Law to show the young man his wickedness. There was nothing he could do in his own self-righteousness to have eternal life. He needed Jesus as his Savior. Romans 3:19 and Galatians 3:24 plainly teach that the Law's purpose is only to show our guilt of sin and need for a Savior. Likewise, Kirk Cameron and John MacArthur pervert Matthew 16:23-25. This is one of the most misunderstood and misinterpreted Scripture passages in the Bible. Does a person have to deny them self to be saved? Jesus was speaking to His disciples, not unsaved men. Jesus rebuked Peter in verse 23 for being carnally-minded. It is unscholarly and dangerous to interpret any Scripture without taking into consideration all other Scriptures. The correct way to interpret the Bible is by comparing Scripture-with-Scripture, which is not difficult to do if you study the Bible as 2nd Timothy 2:15 commands. In John 5:39 Jesus said, SEARCH THE SCRIPTURES! Genesis 15:6; Isaiah 64:6; Ephesians 2:8-9; Titus 3:5; Romans 10:3-4; Romans 4:5-6; John 3:16 (and hundreds of other Scriptures) all teach that salvation is without works of self-righteousness. We are saved solely by HIS RIGHTEOUSNESS (Matthew 6:33). We are saved by the imputed righteousness of Jesus Christ, because of the precious, literal, blood that He gave to pay our sin debt. Jesus died, was buried and rose again. Jesus appeared in the presence of the Father in Heaven on our behalf, applying His physical blood to the heavenly Mercy Seat (Hebrews 9:12,24). In view of so many plain statements throughout the Word of God that salvation is solely of the Lord, it is evil for anyone to teach that a sinner must give up anything to be saved. Salvation is receiving, not giving. Eternal life is a free gift (Romans 5:15), freely offered (Romans 10:13) and freely received (Revelation 22:17). There is much corrupting of the Scriptures today. Salvation is without works of self-righteousness. In 1st Corinthians 3:1, Paul refers to the believers at the church of Corinth as “babes in Christ” and “carnal.” They obviously hadn't denied themselves. They were more than just covetous. They were suing each other (6:6). They were coming to the Lord's Supper drunk (11:21). They were divided amongst each other in quarrels (1:12). Fornication was openly allowed in the church (5:1). They even ate meats offered to idols (8:4). According to the Lordship Salvation crowd, there's no way these rascals could be saved; but the Apostle Paul called them BABES IN CHRIST. John MacArthur completely ignores 90% of the Bible to teach his heresies. The Bible is filled with examples of believers who sinned, lived in sin and ran from God. It's not just a matter of semantics. I am dismayed when I hear professed Christians say that the Bible is not something we should fight over. What? If God is going to judge us for the very words we speak (Matthew 12:36), then don't you think that the Words He speaks are equally important? Yes, of course! Everything that we believe as Christians hinge upon EVERY WORD THAT PROCEEDETH OUT OF THE MOUTH OF GOD (Matthew 4:4). Therefore, I need an every word Bible. God only wrote one Book. There are literally hundreds of English translations, which vary widely in their content, meaning and doctrine. This is why I defend, love and promote only the King James Bible. All other English translations on the market today are corrupt! It does matter, very much, that we have the right message, from a trustworthy Bible. Praise God for the inspired and trustworthy King James Bible! Kindly, MacArthur is spiritually dangerous, because he hides heresies between doctrinal truths, which are the hardest to expose. My friend, it is very easy to be saved, so easy in fact that 3,000 people got saved in one day in Acts 2:41. You don't have to give your life (as Christ gave His life) to be saved! If it were true, then salvation would be the result of partial faith in Christ plus human effort. To lay such a heavy burden upon a sinner's shoulder, requiring them to validate their faith by the way in which they live, is to make salvation HARD, VERY, HARD; but Jesus said, “For my yoke is easy, and my burden is light.” (Matthew 11:30). If you always keep in mind that eternal life is a free gift, paid for by Jesus' precious blood (1st Peter 1:18-19), then you won't be misled. Just as you receive the Saviour by faith and He becomes YOUR Saviour, when you allow Christ to control your life, He becomes YOUR LORD. There is an increasing number of "evangelicals" today who are preaching that in order for a man to be saved he must not only receive Christ as his Saviour, but also must make Him absolute Lord and Master of his life. This doctrine has been termed "Lordship salvation" and has absolutely no support from the Word of God. It is, in fact, another subtle way Satan has invented to get Bible-believing men to add works to salvation without, perhaps, their realizing it, and to do it in such a way that it sounds spiritual and good. What could SOUND more spiritual or honoring to the Lord than statements like: "Either Christ is Lord of all, or He is not Lord at all. And if He is not Lord then He is not your Saviour. You are lost. You must turn over all the strings of your life to Him-then He will save you. Give your life to Him if you want to be truly saved." This is what is taught. The truth of the matter is that salvation is not a "give" proposition at all; it is a "take" proposition. We don't give our hearts, lives, wills, or anything else to God in order to get Him to save us. This would be a form of bribery, a way of meriting or deserving to be saved-but God says salvation is "NOT OF OURSELVES"-and especially, it is not offering anything to God. Salvation is receiving! We simply receive His Son. John 1:12 says, "But as many as RECEIVED Him, to them gave He power (the right) to become the sons of God, even to them that believe on His Name." God does the giving. We do the receiving. SOURCE: “Handbook of Personal Evangelism,” by Dr. Ray Stanford, page 45. "The Greek word translated 'belief' is not referring merely to intellectual attainment or mental acquiescence but a wholehearted acceptance of everything that is implied in the claims of Christ. You need to believe that Jesus is God and that He died for your sins, committing your whole life to Him in sacrifice and serving Him as Lord." (Assurance of Victory—1 John 5, Moody Press, p.12). May I say, the satanic religious cult of Seventh Day Adventism teaches exactly what John MacArthur teaches about faith being inclusive of works. This is a false plan of salvation rooted in self-righteousness. Please read, “Reasons For Not Teaching Lordship Salvation,” by Dr. Ray Stanford. John MacArthur stated in the video: “Coming to Christ means you give up the control of your life, and you yield it to Christ. That's what kept him from salvation, he was unwilling to do that.” The rich young man was self-righteousness, as is John MacArthur and Kirk Cameron. They think that they are saved because they are trying not to commit sin. They are not saved. Anyone who thinks abstaining from sin is a part of their salvation is not saved. Read what Ray Comfort says about Luke 8:13 and how he totally perverts it's meaning. Read how Ray Comfort completely perverts the meaning of Matthew 7:22-23. MacArthur, Comfort and Cameron base their heresies on a handful of pet Scriptures which they have utterly corrupted; when they ought to consider the whole Word of God. Romans 4:5-6 expose all of these men as evildoers for teaching a false Gospel of works salvation. These men are woefully ignorant of the Bible and twist it to their own destruction as 2nd Peter 3:16 warns. They need to be exposed, because they are leading millions of naive people into Hell. The message which these men are teaching is in the same boat as Roman Catholicism—both groups are teaching that faith in Christ is insufficient to save if not accompanied by works. MacArthur is extremely deceitful, because he teaches that salvation is solely by God's grace through faith; while simultaneously also teaching that a person MUST stop living in sin to be saved. It can't be both ways. Salvation is either by grace or works (Romans 11:6). There's NOT two Gospels. Although it is true that love for sin prevents men from coming to the Lord to be saved; it is only because they WON'T come, not that they CAN'T come. John 5:40, “And ye WILL NOT come to me, that ye might have life.” Jesus didn't say that anyone couldn't come; but rather, that they won't come. John 3:20 tells us that those who do evil hate the Light, neither will they come to the Light, lest their deeds should be reproved. The sin-loving world doesn't want anything to do with Jesus Christ, nor His inspired Word. This is why 1st John 2:15-17 warns against loving the sinful world. A sinner doesn't have to give up the world to be saved; but their love for the world will cause them to reject the Savior and go to Hell. MacArthur, Comfort and Cameron have it all backwards. They teach that a sinner must give up the sinful world to be saved, based upon their faulty misunderstanding of the Scriptures; but the truth is that Jesus paid it all, and we don't have to give up anything to be saved. There's 2 types of religions in the world: DO and DONE. You either believe that you must DO self-righteous works to get to Heaven; or else you simply believe upon the Lord Jesus Christ, because His work of redemption is DONE.